Rarely do we make efforts to pat ourselves on the back for a job well done. But here we’re making an exception. 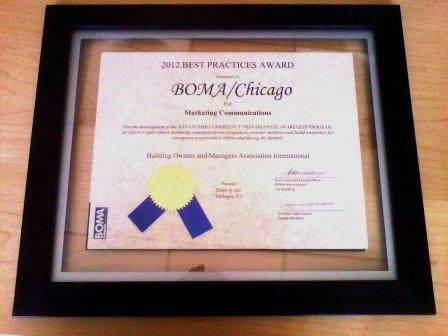 Last month, BOMA/Chicago earned a “2012 Best Practices Award” in the Marketing Communications category for the concerted program launched to provide BOMA/Chicago Building Members – comprised of more than 260 Chicago office properties – the resources needed to weather any emergencies resulting from the NATO Summit here May 20 and 21. The award was given by BOMA International, in essence our “parent company,” during meetings held in Washington on October 19. This was noted on the award: For the development of the NATO SUMMIT EMERGENCY PREPAREDNESS AWARENESS PROGRAM, an effective multi-phase marketing communications program to prepare members and build awareness for emergency preparedness before and during the NATO Summit. Naturally, we’re very proud of this accomplishment. Our efforts to communicate relevant information and news regarding the NATO Summit was, indeed, multi-phase. It included dedicated web pages and an e-newsletter, as-it-happened news alerts and advisories, branded message mastheads, open meetings led by security and communications professionals, and of course, The Elevator Speech blog. One key strategy we employed was to work in unison with other local downtown business and civic groups, and especially with the Chicago Police Department and the Office of Emergency Management & Communications. The potential for chaos during the Summit clearly required a united front. Our efforts were part of big-picture initiatives with a singular goal: To keep the people of Chicago and the places they work and live safe. During the NATO Summit, Chicago was put on the world stage. After all was said and done, Chicago – defined to many by its world-class skyline – stood tall, and life and business went on. We’d like to think our collective communications efforts played a role in that outcome. We welcome your feedback on communications before and during the NATO Summit. In addition, has your property or organization earned an award recently? If so, what lessons or insight can you share?